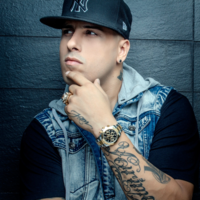 Nick Rivera Caminero (born in Boston, Massachusetts) is known artistically as Nicky Jam. He was born to a Dominican mother and a Puerto Rican father. He is a reggaeton artist known for such hits as "Me Voy Pa'l Party", "Chambonea", "En la Cama", "Buscarte", "Guayando", "Vive Contigo" among others.